The Canon ImagePROGRAF iPF510 has built in poster size printing on a desktop sized printer.Maximum i..
17" wide, 12 Colour Large Format Printer for Photos and ArtThe 17-inch imagePROGRAF-iPF5100 delivers.. The Canon ImagePROGRAF iPF610 that is an asset to any OfficeLarge Format printing - like a ProGet a ..
High Quality Output at a low costThe 24" imagePROGRAF iPF6400S printer is a versatile large format s.. The Canon imagePROGRAF iPF6400SE is a compact printer which allows you to make a big impact.Everythi.. The Canon imagePROGRAF iPF6450 24" Large Format Printer was designed for professionals in the graphi.. Introducing the new, entry-level imagePROGRAF iPF670MFP L24 for printing, scanning and copying your .. The Canon imagePROGRAF iPF670MFP L24 is an entry level wide format printer and scanner that lets you.. Detail Rich A1 Printer for technical CAD drawingSmall but powerful, the iPF680 produces technical CA.. The Canon imagePROGRAF iPF685MFP Pro Large Format Multi-Functional Printer for all your Technical d.. The Canon imagePROGRAF iPF770 offers unparalleled accuracy for the most detailed of plans.Enjoy larg.. The Canon imagePROGRAF iPF780 Large Format printer for CAD and GIS.​Now you can produce consistently.. The Canon imagePROGRAF iPF785MFP Large Format Multi-Functional Printer for all your Technical drawi.. The Canon imagePROGRAF iPF785 Large Format printer for CAD and GIS.​Now you can produce consistently..
Print your technical drawings in B0 size and high detailAny large government or corporate project is.. The high Volume, Large Format Print WorkhorseIf you-re looking to achieve more with less, the iPF840.. 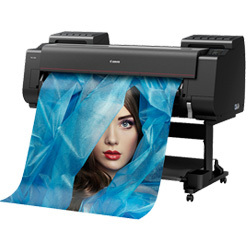 Designed for the production, proofing, photographic and design industries, the iPF8400S large format.. Handle heavy workloads with accuracy, speed and easeMaximise your impact. The iPF850 delivers except..
Poster-size printing on a Desktop-sized PrinterMaximum Printing with minimum effortThe imagePROGRAF ..
24" wide, 12 Colour, Large Format Photographic PrinterYou don't want to lose control of your final p..
44" wide, 12 Colour, Large Format Photographic PrinterIf you're serious about bringing out the best .. The perfect balance of quality and speed for prints to 60"Larger than life qualitySerious about your.. Your Canon printer for big volume, large size precise prints Built with the smarts to make life eas.. Your multifunction large format printer for superior results Pursue every opportunity Take your bus..
A printer for large format CAD drawings, posters and graphics Your printer that’s totally focussed .. Your multifunction large format printer for impressive results A purpose built multi-tasker Your Ca..
A large format printer that handles heavy workloads with ease Ready to carry the load Your compact .. Your high achieving large format printer Embrace every opportunity with Canon’s imagePROGRAF TX-400.. The Epson SureColor SC-T3200 - 24 inch Technical series is a versatile and compact range of printers.. The Epson SureColor SC-T5200 - 36 inch Wide Format Printer Technical series is a versatile and compa.. The Epson SureColor SC-T5200D - 36 inch Wide Format Printer Technical series is a versatile and comp.. The Epson SureColor SC-T7200 - 36 inch Wide Format Printer Technical series is a versatile and compa.. The easy-to-use, 24-inch HP Designjet T120 gives you more for your moneyincluding web connectivity, .. This web-connected printer features intuitive, easy-to-use features to help increase productivity an.. The HP DESIGNJET T1530 36-inch Printer - Dual-roll 36-inch, 6-ink printer for professional-quality C..
Securely, efficiently, and accurately produce quality CAD and GIS applications up to 44 inches Adv.. The HP DESIGNJET T2530 36-inch Printer - Dual-roll 36-inch, 6-ink integrated MFPfor professional-qua.. The HP Designjet T520 is reliable, accurate, and easy to use and is available in 24 inch or 36 inchT.. The HP Designjet T7200 42 Inch Production Printer provides the ultimate productivity in color and bl.. The HP DESIGNJET T730 36-inch Wide Format Printer is a robust and compact Wi-Fi printer for CAD and .. This A2 - A1 HP Designjet ePrinter can print direct from a USB key or wireless. Its color touchscree.. The HP Designjet T795 is an easy-to-use e-printer that scales up to your business needs Process c.. The HP DESIGNJET T830 36-inch Multifunction Printer reinvented—built-in scanner at an unbeatable pri.. The HP DESIGNJET T930 36-inch Printer - 6-ink printer for professional-quality CAD and GIS applicati.. The 8-ink HP DESIGNJET Z2100 24INCH WIDE FORMAT PHOTO PRINTER makes it easy to produce vivid, high-i.. The 12-ink HP DESIGNJET Z3200PS 24INCH WIDE FORMAT PHOTO PRINTER, with new HP 73 Chromatic Red ink, .. The 12-ink HP Z3200, with new HP 73 Chromatic Red ink, delivers long-lasting gallery-quality prints ..
HP DesignJet Z5200 is an outstanding Photo PrinterOutstanding applicationsThe HP DesignJet Z5200 Pho.. The HP DESIGNJET Z5600 44 inch POSTSCRIPT WIDE FORMAT PRINTER produces vivid, eye-catching graphics .. Significantly boost productivity with the high-performance HP DESIGNJET Z6200 42INCH Wide Format Pho.. The HP Designjet Z6800 60 Inch Photo Production Printer is designed for speed and productivity• Prin.. The KIP 70 Series Wide Format Printers is the highest value wide format multi-function system in the.. The KIP 7170 Wide Format Printer is the highest value wide format multi-function system in the world.. The KIP 850 is a Multi-Touch Color Print SystemDOWNLOAD THE PDFOptimize Space and ProductivityThe KI.. The KIP 860 is a Multi-Touch Color Print System DOWNLOAD THE PDF Experience exceptional workflow e.. The KIP 870 is a Multi-Touch Color Print System DOWNLOAD THE PDF A new level of enterprise perform.. The KIP 880 is a Multi-Touch Color Print SystemDOWNLOAD THE PDFUltimate Wide Format experience!The K.. The KIP 890 is a Multi-Touch Color Print SystemDOWNLOAD THE PDFUltimate Wide Format experience!The K.. The KIP 940 is a Color and B&W high production print systemDOWNLOAD THE PDFThe KIP 940 is a color a.. The KIP C7800 is a game-changing wide-format color printer for everything from architectural, engine..
With the amazing new ValueJet 1324 from Mutoh, you get a high-performance 54” eco-solvent printer fe.. The ValueJet 1624X offers true production speeds of up to 20 m²/hr at 720x720 dpi.The ECO-Solvent Va..
64" (1625 mm) Roll and Flat Sheet UV Printer with a single eight-channel print headOverviewThe Valu..
VJ-1628X 64" (1625 mm) 8 Colour Eco-Solvent PrinterMutoh’s New ValueJet 1628X is an eight colour pri..
VJ-1638X 64" (1625 mm) Dual-Head, Double CMYK Eco-Solvent PrinterMutoh's ValueJet 1638X high speed, ..
Mutoh VJ-2638X 2.6 metre (102") Super-wide Format, Dual-Head, Double CMYK, Eco-Solvent PrinterThe Va..
VJ-426UF Tabletop Flatbed UV PrinterMutoh's ValueJet 426UF tabletop UV-LED printer is the perfect fi..
VJ-628X 630mm (24.8") Eco-Solvent PrinterThe Mutoh ValueJet-628X is an Eco-Sol printer offering the ..
VC-1300 1320 mm (52") Vinyl Cutter and PlotterThe ValueCut 1300 vinyl cutter can be used together wi..
VC-1800 1830 mm (72") Vinyl Cutter and PlotterThe ValueCut 1800 vinyl cutter can be used together wi..
VC-600 610 mm (24") Vinyl Cutter and PlotterThe ValueCut 600 is a desktop vinyl cutter that can also..